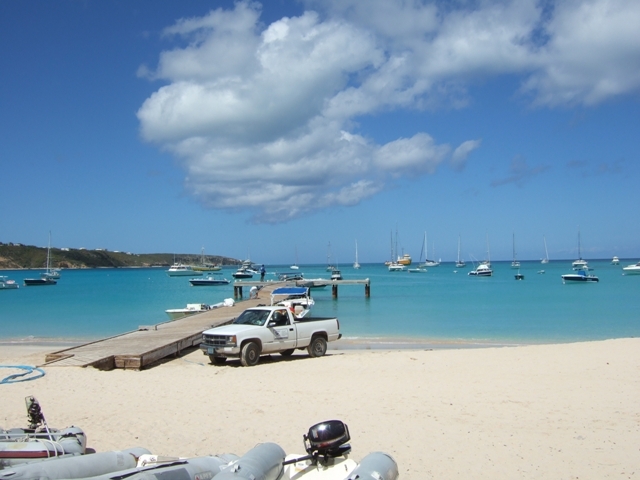 Anguilla - our target northerly destination. 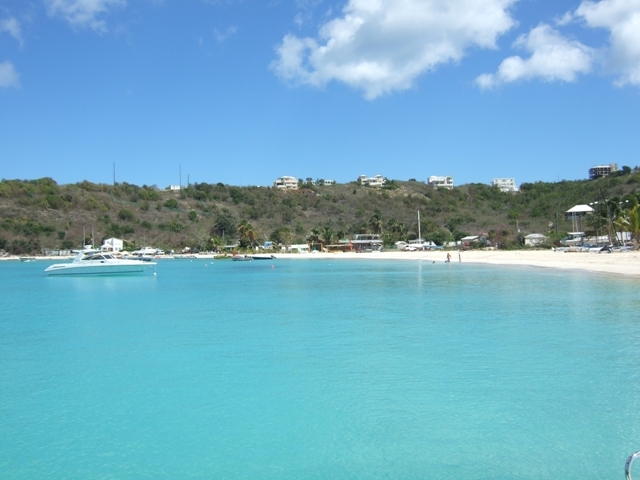 The coast of Anguilla is only 5 miles to the north of St Martin, but the main anchorage is on the northern side giving a total passage of about 10 miles. The wind was light, but enough to give a boat speed of around 5kts with just the working genoa up and a passage time of just a couple of hours. Most of the islands run north/south and so have a windward side on the east and a leeward side on the west. 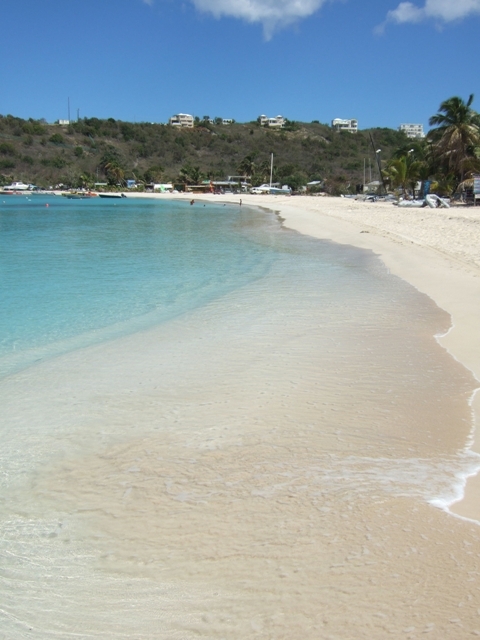 Anguilla is angled from north east to south west, so has no protected side. The net result is that you have to swap sides depending on where the wind is coming from. 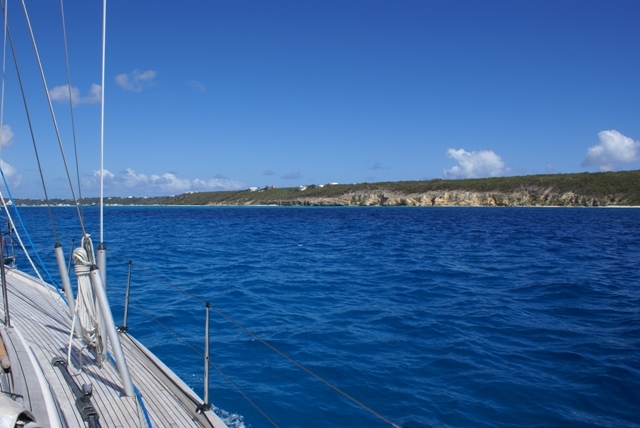 The main anchorage is Road Bay and we dropped anchor there just in time for lunch. While crystal clear water and a lovely bay and beach, it was more crowded with local boats, tugs and other small commercial boats than we had expected, so we ended up anchoring a fair way out. It was a beautiful day and we explored ashore, having checked in with Customs. 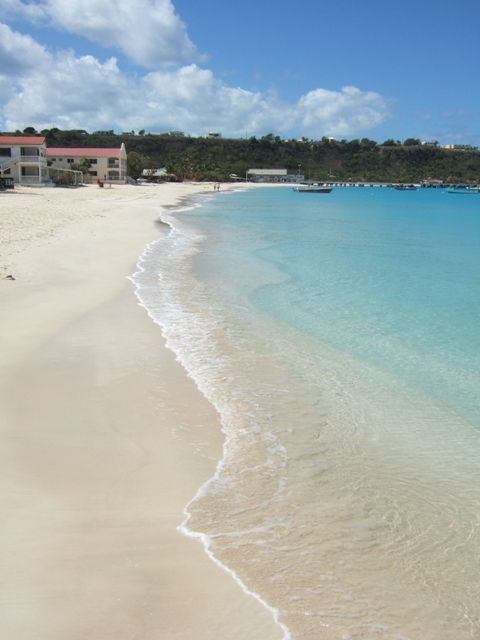 Anguilla is still a British island and quite small with a population of around 7,000. You may remember that Britain sent troops there back in 1969 when they thought the Mafia had taken over the island. Customs occupies a building right on the beach - a big wide beach running all around the bay. The whole place was very quiet and seemed to be drifting along at its own slow pace. The locals were very friendly and when we asked when the shop would open, the owner was found and it was opened just for us.The updated weather forecast predicted the northerly swell would return later the next day so, with no good protection, we only stayed a night and headed back south to St Martin after lunch the following day. From here on in it would be south all the way, meandering through the islands until reaching Trinidad.